The Illuminati experience their first incursion since reforming. Can the loose brotherhood of end times trust each other enough to use the Infinity Gems in unison? And a new member joins the Illuminati! 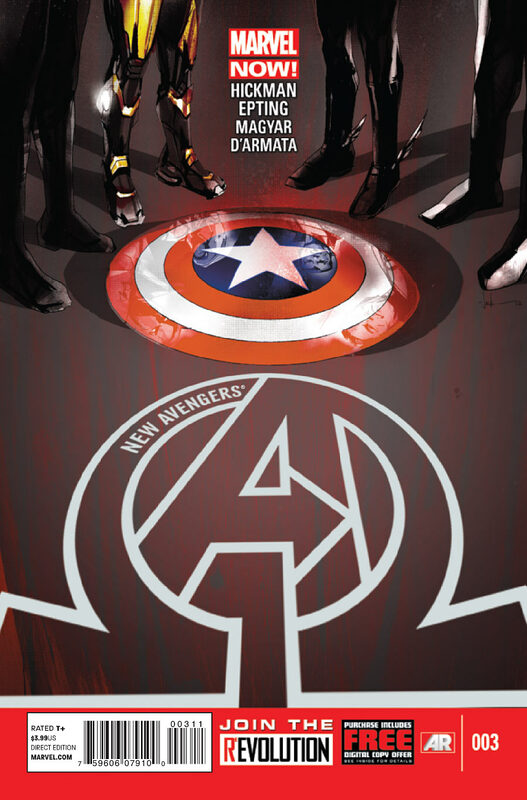 Cover- I like the standard cover where Captain Americas shield is lying on the floor, very symbolic! Crisis- Creation is ending and our heroes manage to end the threat for the time being and may have created other problems for earth but hey, we’re safe for the time being. Bye bye Capt- Sue me and call me a prick but I loved how Dr. Strange just layed out Steve Rogers with a simple gesture. That pompous a$$ wipe has needed a good kick in the gonads since AVX began. Sure it wasn’t a heroic move but I’ll be damned if I didn’t love it! WTF- So Hickman plays his hand and what a hand it is, the destruction of the infinity gems? We already know it won’t last but it was a cool moment nonetheless. Exposition-I’m loving this certainly but New Avengers (2013) Is much too heavy on the exposition to be accessible to modern comic book readers. Hypocrisy- Henry J McCoy, tsk..tsk..tsk. You must be spending way too much time with Wolverine because you’re becoming as a big a hypocrite as that midget nutcase. After all the bitching and moaning about Cyclops keeping secrets etc, Beast just up and joins the illuminati after he damn near endangered existence by time traveling in the “All New X-men series”. Yeah Cyclops is the worst thing to happen to mutants your shenanigans are so much less vile. Boring- Honestly I was bored, and this is coming from someone who had high praise for the two issues that preceded this one. You know what would be great? If at the end of all this infinity stuff panther and storm are still married and storm is pregnant with their son. I get the feeling that T’Challa will come out as the big winner here. If he is being written as canny as he was in the series penned by Christopher Priest, he is light-years beyond everyone else in the gathering. I just trying to put myself in the mind state of black panther,if I had to deal with a divorce from my first love who also tried to exchange her life for mine,my whole country being destroyed which has been protected for generations and I’m the one who allowed it to fall and finally join a team that includes one of the people responsible for its destruction! If he doesn’t come out on top after all that,then he’s gonna wind up like most blacks in America…lost and confused! T’Challa always has a plan. Is the Black Swan an analogue of Susan Richards? And…what was in those french fries Reed fed her? Yeah, I liked how they dropped Captain America from the team. He’s not the ONLY good leader on the Avengers. I bought this book because T’Challa is going to be the central force of the team. And I can see him having a future conflict with Namor. Also, he’d better keep an eye on the mercurial Mr. Stark.